Many people dream of owning mice as their pets, but they are afraid because they are a lot smaller than other rodents. Mice are cute furry little creatures that would provide great company if well taken care of. Like other rodents, mice require cages that are spacious because they love climbing and running around and it should also be easily accessible because it’s important to keep it clean. Unlike for the bigger rodents, however, mice can easily squeeze through even the smallest of spaces and therefore need cages that have very narrow spaces between the bars. After doing some research on the pet cages that are available in the market, we have come up with the ones we believe are the best. Since mice prefer to live in groups, they need ample space that will allow them to move freely about. A pair of females may not require as much space as the males since they are smaller and enjoy each other’s company more than male mice. The number of your pet mice will also determine the size of the cage that you’ll choose. More mice mean you need to pick a larger cage. Ensure that the cage is narrowly spaced between the bars since mice can easily squeeze themselves through small spaces. Sometimes you may not have enough space for a large cage. 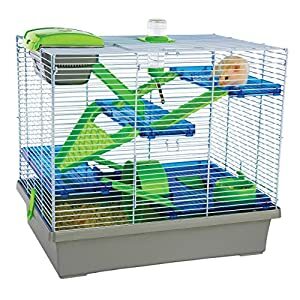 Fortunately, mice are excellent climbers, and therefore you can get a tall cage which is partitioned vertically and connected with ramps or ladders. Cages vary in price depending on the type and quality and while we advise you to go for the best you also need to consider if you can afford the cage. In this case, wire cages are cheaper compared to glass tanks. The most important thing is that your pet is comfortable and there are several ways you can make that possible even with the cheaper cages. Some pets such as cats do not get along well with mice. If you have other pets around the house, you need to make sure that they cannot reach the mice. 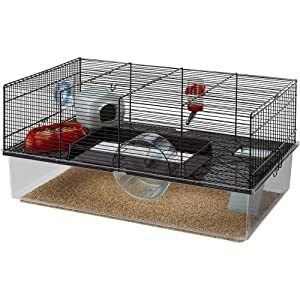 This can be done by getting a solid cage that will not allow the other pets to have access to the mice. It is essential that you interact with your pet mouse regularly to strengthen the bond between the two of you. The cage should allow you easy access to feed and play with your mouse at any time without having to take it out of the cage. The cage should also be easily accessed for cleaning and maintenance. Avoid fully cleaning or disinfecting the cage since mice need to mark their territories. Leave behind some of their litter to ensure that their scent remains. A thorough cleaning should only be done occasionally to prevent the cage from becoming too dirty. Exercise and play are essential for mice as it is a good way to keep them occupied. 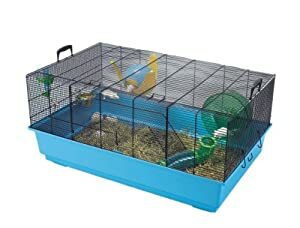 Mice seem to enjoy running on wheels hence you need to make sure that the cage can accommodate the wheel comfortably and still leave ample space for the mice. You can also improvise tunnels by using household items such as tubes from toilet paper or plastic pipes. There are a lot of videos on the internet showing you how you can easily use available objects to make exercise toys for your pet. These are the most common cages among pet owners since they are valued at a lower price and have excellent ventilation. Wire cages also allow mice to climb at the sides and enable you to interact with them while they are still inside the cage. These cages are easy to clean and do not provide an opportunity for the mice to escape. They are best for homes with other pets since they do not allow access into the cages by other animals. You can however easily access the mice from the top of the cage. Some cages come fully integrated with all the necessities that a cage requires including tunnels, water bottles, and more. They can be quite costly but will make your work easier at the end of the day. This wire cage has two floors connected with a ladder to provide ample space for your mouse to exercise and rest. The cage comes fully accessorized with a food bowl, a water bottle with an indicator, a nest, and a wheel to ensure that your pet is comfortable. It has a transparent plastic high bottom which allows you to see your mouse. The base can be filled with sawdust to provide your pet with a hiding space and also hold its litter. The cage allows attachments to be added and the cage to be expanded to create more space for play and as well as allow for more members inside the cage. It has a small door at the top with a security hook which will enable you to access your pet and to prevent it from escaping. The door also allows for cleaning and maintenance to be done inside the cage. The top and bottom can also be separated to allow cleanup to be done on corners that are difficult to reach. Ferplast Cage is safe for your pet as narrow spaces between the bars will not allow it to squeeze through and get stuck while trying to get out, and at the same time preventing other pets from accessing the cage. Why we like it: The cage comes fully accessorized with a water bottle, a nest, a food bowl, and a wheel at a reasonable price. It can also be attached to other habitats to create more space. This cage is large enough to accommodate two mice comfortably without needing to expand it. It is great for those who have male mice since it provides them with their own space and avoids fights. 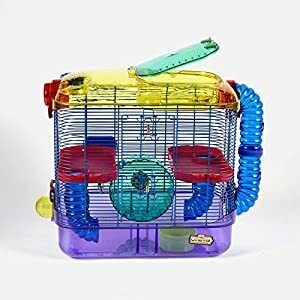 The cage is simple but fully equipped with a food bowl, a water bottle, nesting area, a wheel, and a tunnel to ensure that your pet is comfortable and gets enough exercise and play. The cage has a door at the side to allow you to have access into the cage and two hooks to secure the door into place to avoid accidental escapes. The large bottom is made from good quality plastic which holds litter and provides enough space for your pet to dig through. It is easy to assemble, and the plastic base can be easily removed to empty the bedding and clean corners that are difficult to reach. It also has a sturdy wire top to hang treats and toys for your pet. Like any other good pet cage, the spaces between the bars of this cage are narrowly spaced meaning that your pet will not have a chance of escaping. The only downside to this cage is that it is quite expensive, but the size of the cage as well as its quality makes it worth the money. Why we like it: The cage is very spacious and can comfortably accommodate several mice. It also comes fully equipped making work a lot easier for you. This cage would make an excellent habitat for your small pet. It has two levels of living space which provides your pet with more than enough room to climb, play and relax, and it can accommodate more than one mouse. The cage also has a removable petting zone which allows you to access and interact with your pet and this will strengthen the bond between you and your pet. The cage comes fully accessorized with a food bowl, a drinking bottle and an exercise wheel which will keep your pet active throughout. It has a sizeable detachable bottom for holding litter, and it can also be easily separated from the top to allow you to clean corners and places that are difficult to reach. The wire doors at the front of the cage will enable you to feed your pet and do quick maintenance with ease, and the bars are spaced narrowly to prevent your pet from squeezing through. The Kaytee CritterTrail 2-Level Habitat is an awesome cage since it is designed to allow as much expansion as can be done to it. The company also sells accessories such as tunnels to attach top the cage to increase your pet’s adventure. It is also possible to attach the cage to another cage especially when you get more mice. Why we like it: The cage has a petting zone, and it comes fully accessorized plus it can be connected to other habitats to add space to it. This 3-level habitat would make an excellent habitat for your pet mouse. It has a beautiful homely design with a front made of clear plastic to allow you to have a full view of your pet, and sides made of wire to ensure that your pet gets enough fresh air. The cage also comes in various colors so you can choose the one that you like best and is spacious for your pet to roam around freely. The floors of the cage are connected by ramps which your pet can climb with ease. IRIS Hamster Cage is equipped with a food dish, a water bottle, and a wheel to ensure that your mouse is comfortable in its habitat and gets enough exercise. It also comes with a small plastic house which acts as a shelter. The cage can be accessed from the top which has two openings as well as from the side making it easier for you to access and interact with your pet. The plastic bottom is large to allow your pet to burrow through the bedding and it is also detachable to allow the cage to be cleaned and disinfected. Why we like it: The cage is cute, and it has three levels which provide more room for your pet. Apart from the side door it also has two openings at the top which makes it easy to access inside. 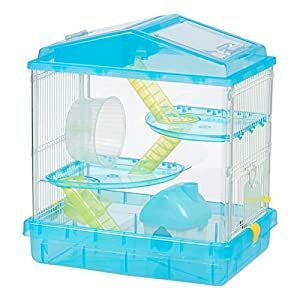 This cage has three levels that are connected with ramps which your pet can climb easily. It has plenty of room to allow your pet to move freely about and it can accommodate two or more mice. The cage is equipped with a water bottle, a food bowl, and an exercise wheel and it also includes a petting zone for you to interact with your pet. The petting zone can also act as a shelter for your mouse. The cage is made from sturdy wire and good quality plastic to ensure it stays intact for a long time.it has a door at the front to access the cage for feeding and quick maintenance. It also has a large plastic bottom to provide enough space for your pet to tunnel freely through the bedding. The base can also be detached easily for cleaning. There is a shelter at the nesting area where your pet can hide when it needs privacy or to rest. The cage is escape proof since the bars are narrowly spaced even for small mice, and it is also secure as other pets cannot reach the mice. It is easy to assemble by just snapping the parts of the cage together. Why we like it: The cage is good quality, and it has a petting zone for you to interact with your pet. It is also very spacious, and your pet can roam around and burrow freely. It shouldn’t be hard for you to choose from one of these cages. You can go for the one that you can afford or which you think is best suited for your furry friend. As you shop, you should consider the number of mice you want to keep as well as how often you want to interact with your pet. We hope that you and your pet will have a strong bond made even stronger by a good cage.